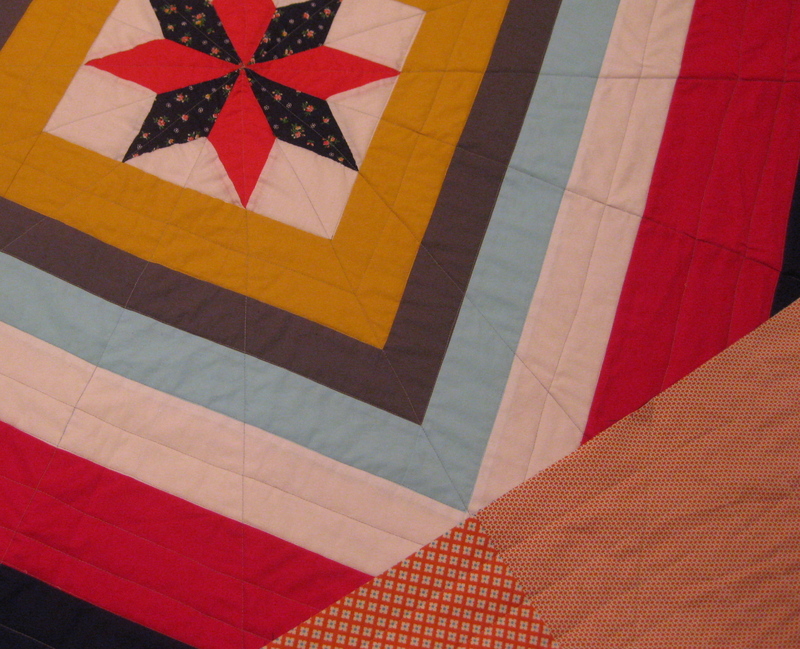 This quilt has been an unexpected pleasure to work on. Although it would have been a lot simpler to have known the final design from the beginning, the false starts were a great learning experience. I think the final design has a sort of superhero/super star vibe that is perfect for kids. 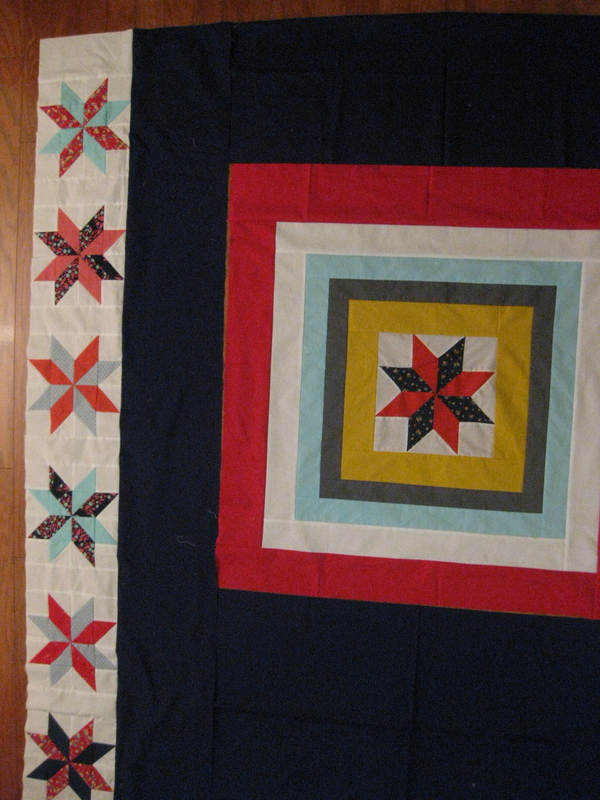 For the quilting, I extended the lines from the star to the edges and then stitched in the ditch around the square frames. 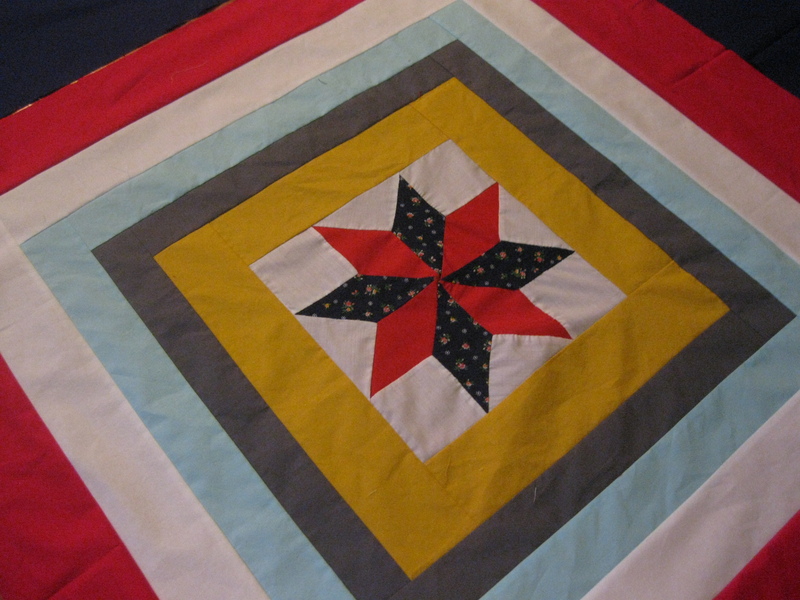 There is a little puckering at the bottom of the quilt where the frames and the rays from the star intersect–grr. I don’t think it will be very noticeable after the quilt is washed, but I would love to know how to prevent this from happening. (This is why I love quilting in a diamond grid–nice and smooth every time!) The backing fabrics are two Denyse Schmidt prints from Jo-Ann Fabrics. I wasn’t sure the prints would work, but I really like how they look with the quilt top. All that’s left to do is the binding. I am leaning toward charcoal. Too dull? I also have a gold honeycomb print in my stash that might be good? This entry was posted in Giving back, kids stuff, Modern Quilt Guild, quilts and tagged 100 quilts for kids, center star quilt, charity quilt, Denyse Schmidt, kids quilt, modern quilt on August 28, 2013 by brigitdermott. 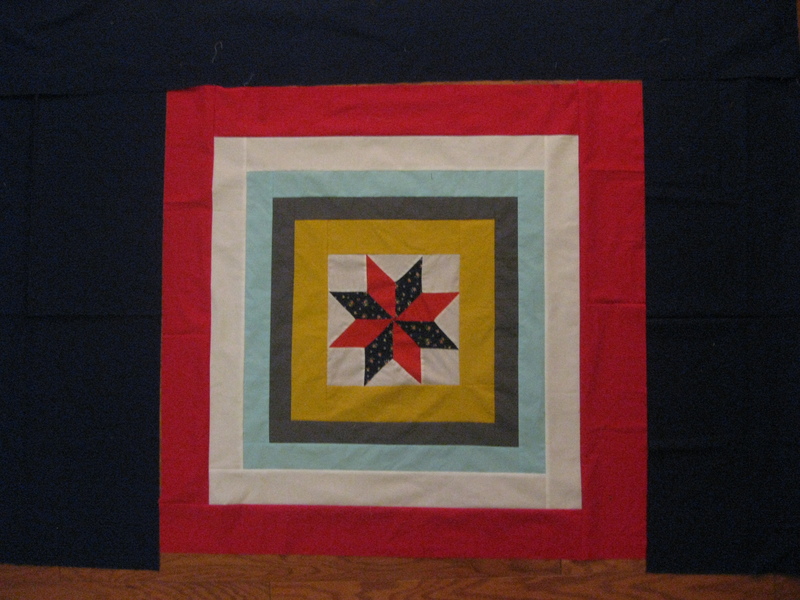 I made several blocks in a pattern that matches the UFO block that I chose from my Modern Quilt Guild exchange. The blocks were super fun to make. 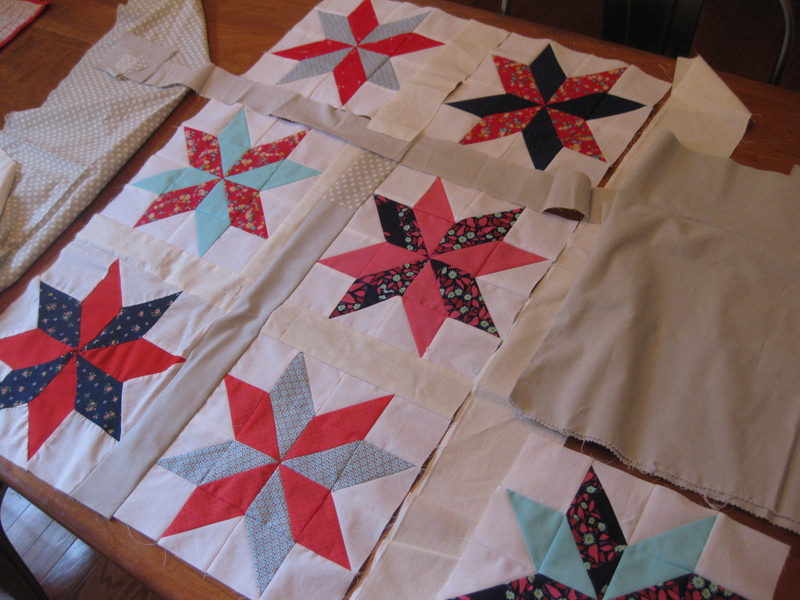 I don’t often make traditional blocks–so I was pleased to see that my seams lined up! So far so good. Except then I had to find a way to piece them together so the UFO block (which is slightly larger and hand pieced) won’t look like an alien among the new blocks. First I tried a sort of scrappy approach with bone white and gray. I didn’t think the pale colors worked with the bold colors in the stars. 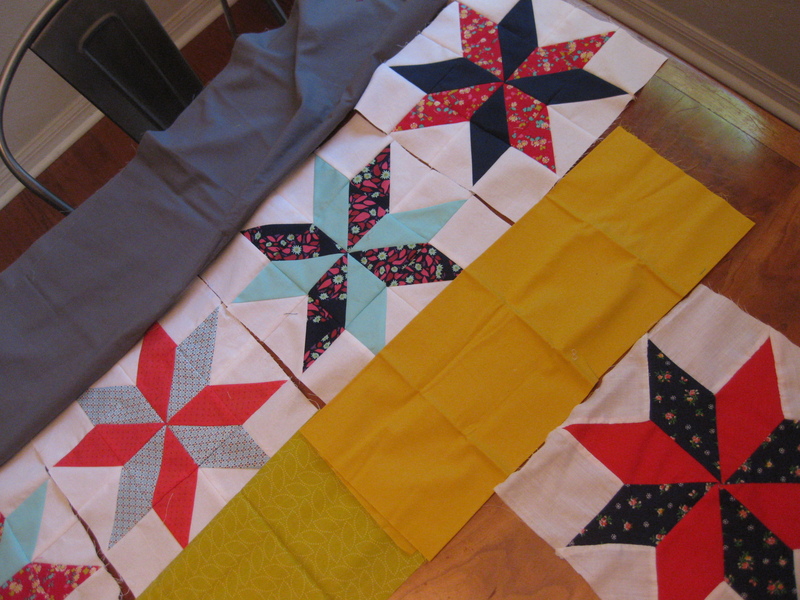 Next I placed the new star blocks in a strip and tested some darker colors next to it. I like the charcoal and mustard yellows. I think I might finish the top by placing the UFO block at the center of a log cabin with more mustard and maybe some hot pink? I really need to finish this top up so I can get it quilted by our guild meeting on September 3. Yikes! 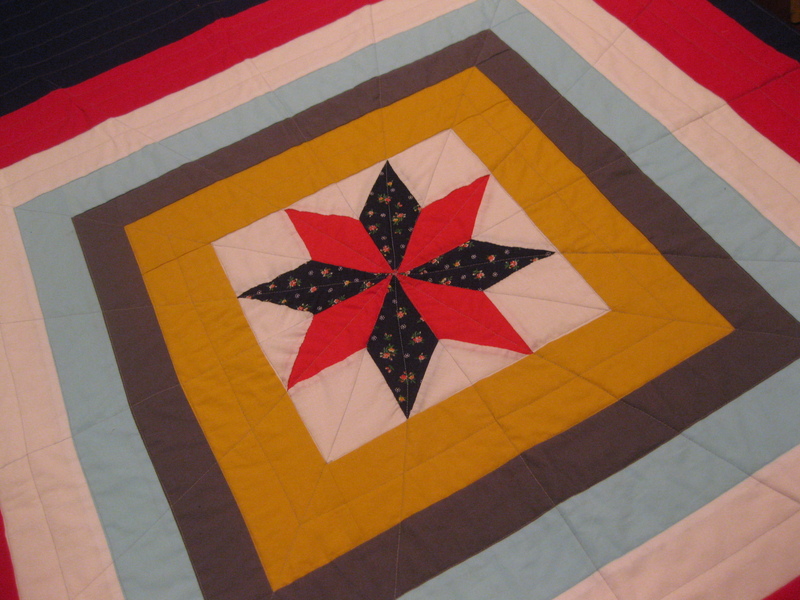 This entry was posted in Giving back, Modern Quilt Guild, quilts and tagged 100 quilts for kids, charity quilt, half-square triangle pattern, improvised piecing, modern quilt design, UFO on August 19, 2013 by brigitdermott.